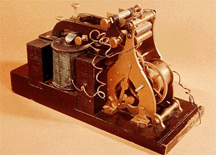 The Samuel Morse Telegraph Receiver that was used to receive the message, "What hath God wrought," during the demonstration to Congress in 1844. Over the remainder of the nineteenth century, the equipment improved dramatically, but the demand for bandwidth grew even more dramatically. To limit costs, senders of telegrams turned to a vast array of so-called telegraph codebooks, which contained code words that stood for often-used phrases or sentences. Prior to sending messages, people would agree to use a specific code, and thereby save money and time in message transmission. For instance, "The Nautical Telegraph Code Book and Postal Guide," edited by Capt. D.H. Bernard (London, 1908), defines the code word seclusion, to mean, "Sorry to say ship caught fire last night — serious damage." Fifty years from now, people will write about our use of telephony for distributed meetings. They'll describe the artifices we use to resolve speaker identity, recognize speakers, and manage interruptions. And these devices will seem as quaint to people in the future, as the telegraph codebooks seem to us now. Photo courtesy Smithsonian National Museum of American History. We cannot anticipate every problem facilitators might encounter in synchronous distributed meetings, but some are fairly predictable. And we can manage some of these problems more easily either by limiting their incidence, or by establishing protocols for them in advance. Here are three examples. In face-to-face (F2F) meetings, identifying the speaker is usually easy. We can either see the speaker, or we can recognize the voice, or tell which direction it's coming from, even if the facilitator recognizes the speaker by inaudible means such as a slight gesture. In the distributed context, especially audio-only, identification can be problematic. To address the difficulty, the facilitator can recognize the speaker by name, and the speaker can begin by stating his or her name. And before the meeting starts, we can make available a podcast with attendees introducing themselves in their own voices. To support their telemeetings, some groups use complex technologies that go beyond telephone or videoconferencing. Tools for sharing drawing spaces, displaying slide presentations, and even manipulating physical objects all require special skills. Although these technologies are at the frontier of remote facilitation, some useful practices have emerged. First, ensure in advance that all sites have operative installations. Pushing ahead when it's known that some sites don't have functioning installations risks corrupting meeting deliverables. Second, ensure that any participants who must use the technology have had adequate training. Third, have technical support staff standing by during the meeting for advice or repair if necessary. Finally, be prepared to halt the meeting and reschedule it if essential technology doesn't function correctly. In F2F meetings, participants who interrupt others create problems, but facilitators can handle them fairly easily. And when interruptions do occur, everyone can usually sort out what was said. In distributed meetings, especially over the telephone, we can't always identify the interrupter and we often can't sort out what was said. "Zero tolerance" for interruptions is probably an impossible goal, but you can adopt practices that reduce their incidence. In advance of the meeting, establish a norm that prohibits routine interruptions, and establish a protocol for emergency interruptions. Circulate news flashes before the meeting or as a first agenda item to reduce the need for people to inject news during discussions. Interruptions that come about during heated debate are another matter; deal with repeat offenders privately. For an examination of some issues that arise in synchronous distributed meetings, see "Remote Facilitation in Synchronous Contexts: I," Point Lookout for March 26, 2008. For suggestions for facilitating highly charged distributed meetings, see "Remote Facilitation in Synchronous Contexts: II," Point Lookout for April 2, 2008. Would you like to see your comments posted here? rbrenTDkCOeuVwaXkzWqpner@ChachbvXAEVUBBheBCGQoCanyon.comSend me your comments by email, or by Web form. I offer email and telephone coaching at both corporate and individual rates. Contact Rick for details at rbrenqWpFJyeJCHtDtfCrner@ChacLLqxQyjfBDfIApgAoCanyon.com or (650) 787-6475, or toll-free in the continental US at (866) 378-5470.